Georgia Madden added this to How Do I... Paint My Bathroom Properly? Do I really need to prep walls? Absolutely. The prepping process is just as important as the painting process if you want good results. Walls need to be clean, dry and free of contamination for paint to adhere to them properly. So, start by wiping down walls with a mild detergent and then rinse clean with water. 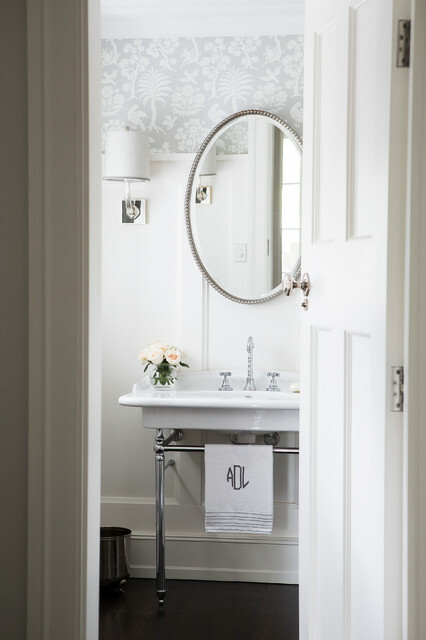 If you’re painting an old bathroom where enamel finishes were previously used on the walls, I’d recommend lightly sanding them back and applying a coat of primer to ensure that the new paint can adhere to the surface.And don’t forget to protect surrounding surfaces and fixtures when you paint; cover the floor and fixtures with drop cloths, and apply masking tape to any small fittings (such as handles) that can’t be removed or that will be tricky to paint around. Wall paneling in the bathroom instead of tiles and wood look tilesfor the floor. Love the idea!